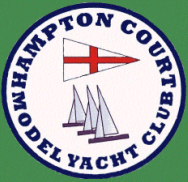 John Tushingham from Keighley dominated the Micro Magic fleet over the weekend of 10th and 11th May to win the UK Open Championship held at Hampton Court MYC. A hardy bunch of competitors used Friday afternoon to put in some practice and get used to the lake. 7 Micro Magics sailed their own virtual regatta in pleasant sunshine and 16mph winds and by 5.30 it was deemed that everyone had had enough practice for the main event. Saturday morning saw 20 boats in the line up and two fleet sailing was necessary. Buzz Coleman (Coalhouse Fort) and John Tushingham won their respective seeding races which in fact set the scene for the remainder of the championship. The SW wind blew hard all day with the highest gust recorded at 35mph, enough to blow away anything not tied down securely. The boats which sported their smallest D or E rigs coped extremely well whilst those competitors with no rig smaller than a C rig had to work hard to keep their boats driving against the wind. A straight forward windward/leeward course was set throughout the weekend and as a result at no time were the boats more than a few metres away from their skippers which is certainly a bonus when racing these small boats. At lunchtime we were treated to delicious bacon sandwiches, doughnuts and tea or coffee in the clubhouse all prepared by Jennifer Blair and her catering team. A further treat was in store as, at the afternoon tea break, jugs of Pimms were brought up to the lakeside as well as tea and coffee – guess which was the most popular! At the close of racing at 5pm on Saturday a total of 8 complete races had been sailed. Preliminary results revealed John Tushingham leading with 15pts, Buzz Coleman next with 18pts, Jan de Best from the Netherlands third with 22pts and Gerard Pabbruwee also from the Netherlands in fourth place with 24pts. Following the racing on Saturday, some 30 competitors/race officials/helpers and partners enjoyed a splendid BBQ with all the trimmings prepared by Jennifer and her husband Duncan, one of the competitors, followed by a delicious homemade trifle. There was sufficient food left over to provide an excellent lunch on the Sunday for everyone. Sunday brought similar weather conditions but with less severe gusts. Unfortunately, some competitors from Saturday without D or E rigs did not sail which reduced the fleet to 16 boats allowing one fleet racing for the remainder of the championship. 19 further races were run and as the day wore on, the skippers were becoming more adept at sailing in the windy conditions and Duncan Blair (Hampton Court) managed some good results despite having no rig smaller than C. At the close of racing the leading positions were; John followed by Buzz. Gerard had moved up to third with Jan following in fourth. A special mention for Julia Hancock, a new member at HCMYC with very little experience who nevertheless came fourteenth - her determination and skill showed that she should do even better in the future. A very successful event; made even more enjoyable by the competitors and visitors from Denmark Holland and Belgium joining us. My thanks go to my Race Team of Laurie Bower, Tom Davies, David Mayne, Dave Wykes, Graham Gurney, Gordon Beddall and Peter Smith for all their hard work in helping make the event a great success. Special thanks also go to Jennifer Blair and her team for the splendid catering.